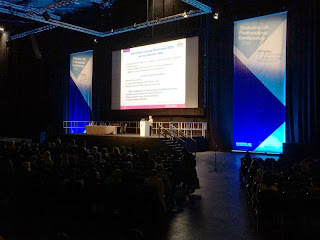 I'm a bit late posting this, but I just wanted to jot down a few thoughts following last week's Diabetes UK Professional Conference 2015 (#dpc15). I was, as the saying goes, dead chuffed to be invited to be one of the bloggers/tweeters co-opted onto Diabetes UK's Press Team for the three day conference in London's sunny docklands where the great and the good of the world's diabetes healthcare professionals, researchers and pharma companies gather for a good old chinwag about all things pancreatically challenged. 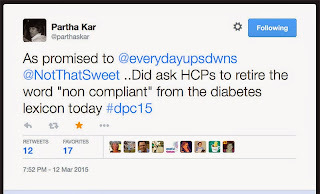 DPC is one of the biggest events in the global diabetes calendar and patients are not normally allowed to attend for complex reasons involving a Pharmaceutical Industry code of practice (and possibly also so that they can speak fluent doctor-technobabble unhindered and don't have to watch what they are saying about how bloomin' annoying patients are and how the whole business would be much easier without us). However as honourary members of the Press Team we were encouraged to tweet, blog and generally feed information from the conference to the world at large, including you lot. It was the first time I have been at an event anything like this and it was absolutely huge. Whatever presentation you were attending you got the distinct impression that there were at least six other things running simultaneously that you'd like to be having a look at. Attendance this year was apparently bigger than ever, though #DOC peeps who had been to previous conferences commented that Excel's cavernous spaces made it seem a bit more spread out. At least as valuable as the presentations themselves seem to be the incidental networking and bumping-into opportunities. Everywhere you went people near you were meeting up, rekindling connections and sharing information. People who have attended more than a few of these conferences must have quite a hard time getting to any sessions at all, because there are so many people to chat with as you move from one place to another. On a personal level it was great to be able to meet again, or for the first time with so many amazing members of the DOC incuding, Grumps, Annie A, Laura, Sandy, Charlotte, Hannah, John, Annie C, Kath, Roz, Lis, Partha, Pratik, Pete, Neil and others whom I have doubtless forgotten (sorry!). It was also a great privilege to meet with Barbara Young, Chief Executive of Diabetes UK who took time out of her hectic schedule to meet with the bloggers/tweeters and stayed chatting longer than she had intended. She was quite an inspiration, and seemed genuinely interested in listening to feedback and input from the diabetes coal face - about what matters to people with diabetes and their families. Someone commented that Diabetes UK often get a hard time about occasional gaffes, but rarely seem to blow their own trumpet when they do make a positive impact (like here, where they have got the Government to change ther mind about prescription fines). It was only a brief conversation, but it was quite uplifting and I got the feeling that DUK was in very safe hands. It was great too to be able to meet up with representatives of various pharma and device companies that I have bumped into over the last few years to get a feel for any exciting new toys that might be in the pipeline. Between us, the bloggers/tweeters tried to divide up and 'live tweet' from as many sessions as possible. This proved to be quite a challenge as the talks are short and intensely packed with information, new research data and other interesting snippets. By the time you have tried to compose a phrase which is as close to a quote as you can remember, with or without a photo of the projected slide and then edited for 140 characters, the speaker has chased on at a rate of knots and you are playing catch up. Short answer, yes. For people with type 2 diabetes various intermittent fasting apporaches (eg 5:2) seem to be easier to stick to and more effective for weight loss than continual energy restricted approaches. Fasting days in the research data tended to be approx 650cals and low carb, but results were equally good if low carb but not calorie restricted. For those in whom the approach worked there tended to be an effect on the non-fasting days too. Even though people *could* eat more freely, they did not necessarily do so. Not something I'd really heard of, but fermentable carbohydrate (think dietary fibre... pulses... resistant starch... oats...) seem to have promising effect in the context of type 2 diabetes. Results were a little mixed across different studies, not least perhaps because it can be quite hard to evaluate how much FC is in different foods. It may act as a sort of appetite suppressant. When 21g was given as a dietary supplement it resulted in reduced energy intake for the diet of people with Type 2 even if they were not asked to eat less. Fermentable carb was shown to have a positive effect on the phase 1 insulin response of people with type2 and even non diagnosed family members. Insulin sensitivity has been shown to improve in the presence of fermentable carb too. Unfortunately too much fermentable carb can have unfortunate gastric side effects - the gas released from the fermentation of pulses in the gut being an obvious example. This was an extremely data-rich overview from some new JBDS data, including effective new protocols for management of people on corticosteroids and variable rate insulin infusion (sliding scale) in inpatient settings. Also presented a was a huge new piece of research by Norfolk and Norwich Hospitals into nationwide outcomes/detail of DKA management. Some of which was pretty scary stuff - the risk to inpatients with diabetes of experiencing Severe Hypoglycaemia for people with diabetes is 1 in 50 and risk of developing DKA while in hospital is 1 in 200. As alarming as this presentation might have been there was certainly a sense of concerted effort to tackle the challenges of inpatient management of diabetes and establish effective protocols that improve outcomes. I was really taken by this presentation. It outlined a 'three dimensional' model for improving diabetes care by fully integrating clinical, psychological and social approaches. Both type 1 and type 2 diabetes are associated with every major type of psychological disorder, and people with any of these mental health challenges find self-management of this complex and fickle condition additionally challenging. In addition, people living with severe social deprivation are significantly less able to self-manage. Put simply, diabetes is way down on their list of priorities. Address other areas in patients' lives (housing/debt/mental health) and they are released into better self care. 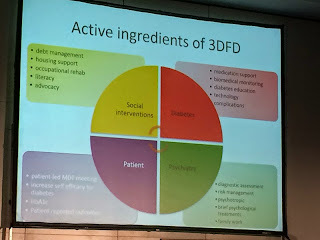 The 3DFD is a short-term intervention with a lasting impact and has moved from an interesting research idea to become a commissioned service in several UK locations. Initially seen as a 'luxury service' it is not only cost-effective, but actually pays for itself several times over in terms of savings made in other areas. Some really interesting stuff here about what happens when the body is subjected to repeated mild hypoglycaemia. The exact brain and body chemistry that is at work in the loss of hypo warning signs, and also the loss of counter-regulatory hormone response (epinephrine/glucagon/liver dump). Initially the brain fires all it's warning bells when blood glucose levels drop too low, but soon enough it learns to adapt. Attempting to 'perform better' at those lower levels and not expending the energy of those warning signs. Ultimately though, the brain can no longer function at the lower and lower glucose concentrations that can be reached without warning. Avoidance of hypoglycaemia can reverse this and 'reset the switch', but many struggle with undetected nocturnal hypoglycaemia which sets back their efforts. It was really good to see psychological support given so much coverage at the conference. Particularly in relation to children and young people where effective and timely psychological interventions can have such a dramatic effect. Great stuff here from the folks behind DAFNE HART, a successful pilot which demonstrates the importance of psychological support in changing people's behavior and understanding of their own relationship with hypoglycaemia. It was particularly good to see the 'compare and contrast' conversation scenarios between healthcare provider and PWD. The difference between people feeling told off/lectured and people being supported to make positive change through responsive listening and motivational interviewing. Great to see social media and peer support getting such a good response at a conference like this. Topics covered ranged from social media in support of nursing practice; tackling isolation and the building of patient communities; and whether social media could be the 'missing part' of someone's diabetes care. 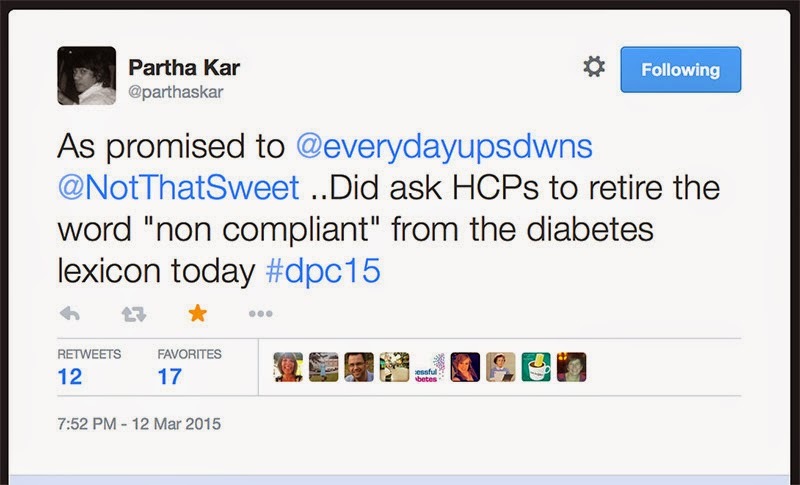 Not only that, but Partha Kar opened his talk by suggesting that the term 'non compliant' be removed from the diabetes phrasebook as a result of some social media interactions at the conference. The session ended with a frantic live Tweet Chat and I just hope that some of those who saw the presentations might begin to consider how to integrate social media/peer support into their own practice. A bit of a mixed bag across these three presentations. Both type 1 and type 2 diabetes seem to associate with 'cognitive decrement' (which I don't like the sound of to be honest), though this only subtle and does not seem to worsen over time. When it comes to type 2 diabetes the Edinburgh study suggests that vascular changes may be the predominant factor. Blood pressuse has little effect, HbA1c has a small effect but smoking has much more of an effect. Overall, improved diabetes management and lack of diabetes complications seem to be a good thing as far as keeping your marbles is concerned. Conversely people with both Alzheimers and T2D are at significantly increased risk of severe hypoglycaemia. When it comes to young people, there did not seem to be much evidence that mild hypoglycaemia was associated with impaired cognitive function in the long term. Though there may be small risks to very young children who experience severe hypoglycaemia and coma, the brain quickly becomes more resilient in older children and young people. I was particuarly struck during Miles Fisher's presentation about assessing cardio-vascular risk in people with diabetes when he described the decision to recommend statins for the primary prevention of CVD in people with type 1 diabetes as an 'OBSAT' decision. With a twinkle in his eye he explained the acronym as 'old boys sat around a table'. He suggested that the research evidence did not support the recommendation and that there was a risk of 'over medicalising' the population. His opinion was that the presence of micro-abuminuria was a more reliable marker for prescribing statins for primary prevention in T1D. In general terms intensively managing blood glucose levels, the earlier the better, significantly protects against CHD for people with diabetes. This was my last session of the conference and the one that provoked perhaps the greatest interest on Twitter. One of the slides in Rob Andrew's presentation showed a flow chart which seemed to contradict itself. Beamed off into the ether without the explanatory dialogue many people responded, "Ehhhhhhh?!" but the presentation had moved on apace. A lesson learned perhaps in the perils of trying to share complex ideas in 140 characters at speed. There was a lot of detail from Rob Andrew about managing exercise and type 1 diabetes, you can find more information here when the site launches soon. Some interesting snippets too from Richard Bracken about bone strength in T1D. I had not realised that type 1 was associated with an increased risk of fractures, but it seems that resistance training can help improve bone condition and strength. On the whole I was really encouraged by the conference programme, and by the tangible sense of passion and commitment from those working in the field who are aiming for better outcomes and more personalised care for people with diabetes. Huge thanks to Diabetes UK for inviting me to be a part of the event. Disclosure: My travel, accommodation and entry to the conference were paid for by Diabetes UK. I was not paid to write this post or any tweets relating to #DPC15. Thanks for the info Mike, never knew how much of a role Fermentable carbohydrates had on diabetes. My sister was just diagnosed so I'm trying to educate myself on diabetes as much information as possible to help if I need to take care of her. Thanks again!